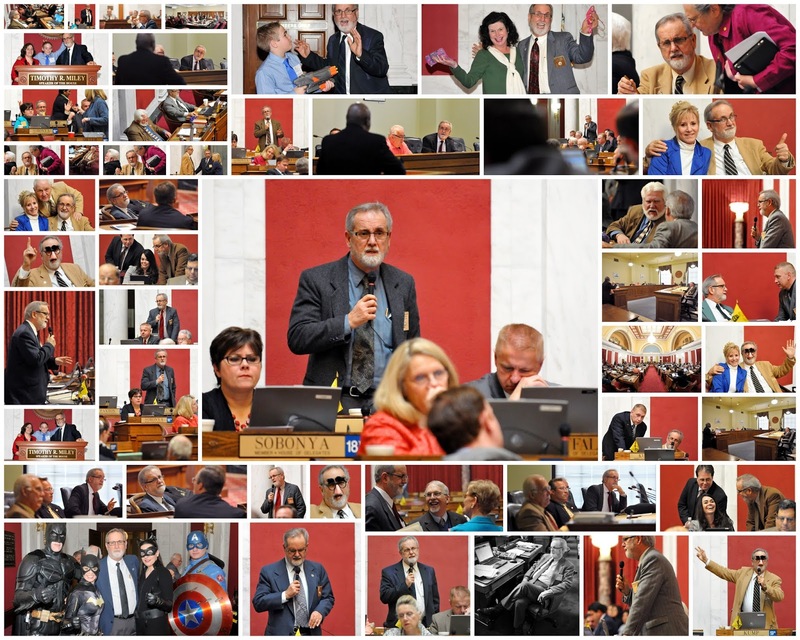 With the completion of the "Cross-Over Day" deadline for legislation to pass the originating West Virginia Legislative Chamber (House of Delegates or Senate), there are four bills which recently passed the House of Delegates that prompts further comment and analysis. HJR 113 is the proposed amendment to the West Virginia Constitution that would allow individual counties to increase the amount of property tax credits (Homestead Exemption Act) given to senior citizens and the disabled. Since HJR 113 is an amendment to our West Virginia Constitution, it requires a two-thirds vote of approval by both chambers of the Legislature (House of Delegates and Senate) and then an approving referendum by voters in the upcoming November election in order to become law. HJR 113 was approved by the House of Delegates by an unanimous vote and now goes to the Senate for further consideration. Note: Although my preference is to reduce or even eliminate property taxes for all West Virginia homeowners, HJR 113 at least has the potential for providing much needed property tax relief for senior citizens and the disabled. HB 4263 is the West Virginia Buy American Act proposal, which callously trades upon a popular slogan and our national pride in order to increase the cost to taxpayers for public building projects. Instead of simply requiring contractors to make a reasonable effort to use American made products in public project construction, HB 4263 establishes a complicated "Rube Goldberg" set of approval rules for the use of construction materials. It also could require taxpayers to pay contractors much more than normal competitive prices for those construction materials. Even worse, the rules set by HB 4263 are so byzantine and stifling that it even actually could discriminate against West Virginial contractors and cause them to lose business because they cannot readily obtain American made project materials. HB 4263, despite its good intentions, is not a jobs creation bill. It actually could do much more harm than good.Contractor and Delegate Daryl Cowles (R-Morgan County) made valiant attempts to correct (amend) some of the worst inequities in HB 4263, but was voted down (Roll Call #136: 33 yeas, 62 nays, and 5 not voting; Roll Call #137: 31 yeas, 64 nays, and 5 not voting). Eastern Panhandle yea votes for both amendments by Delegate Cowles were Delegates Daryl Cowles, Walter Duke, Eric Householder, Larry D. Kump, Jonathan Miller, and John Overington. Voting nay on both amendments were Delegates John Doyle and Tiffany Lawrence. HB 4263 then passed the House of Delegates (Roll Call # 159 : 82 yeas, 16 nays, and 2 not voting ). Eastern Panhandle votes against passage of HB 4263 were Delegates Daryl Cowles, Eric Householder, Larry D. Kump, Jonathan Miller, and John Overington.Voting for passage of HB 4263 were Delegates John Doyle, Walter Duke, and Tiffany Lawrence. This legislation now goes to the Senate for further consideration. HB 4392 increases the salaries of magistrates. (Roll Call # 130: 65 yeas, 30 nays, and 5 not voting) If enacted into law, it will have increased the salaries of lower tier magistrates by $27,000 over the past nine years. HB 4392 now goes to the Senate for further consideration. Note: Nay votes In the Eastern Panhandle were Delegates Walter Duke, Daryl Cowles, Eric Householder, Larry D. Kump, Jonathan Miller, and John Overington. Yea votes were Delegates John Doyle and Tiffany Lawrence. It now goes to the Senate for further consideration. HB 4281 would provide a modest salary increase for State Troopers and unanimously passed the House of Delegates. It now will go to the Senate for further consideration. Meanwhile, the West Virginia House of Delegates now turns its attention to consideration of legislation previously passed by the Senate. The main topics of discussion during the Eastern Panhandle Legislative Caucus this morning were Homeowners Association issues, the Homestead Exemption Act, and a modest increase in State Trooper salaries. Due to the complexity of the issues, there will be an effort to include Homeowners Association issues in a legislative interim study committee during this Summer. A Constitutional Homestead Exemption Property Tax Amendment to allow an increase in the property tax credits for senior citizens (HJR 113) has passed the House of Delegates Constitutional Revision and Finance Committees Committees, and now is pending a vote by the House of Delegates. A modest increase in State Trooper salaries (HB 4281) also is pending action by the House of Delegates. 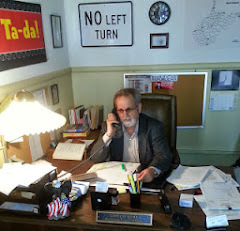 Delegate Larry D. Kump will be the guest speaker on WRNR Radio from 8:40 AM - 9:00 AM on Monday, March 5th, 2012. WRNR Radio is broadcast at 740 AM, 106.5 FM, and www.talkradiowrnr.com. In Berkeley and Jefferson Counties, WRNR radio also is broadcast on Comcast channel 10. Legislators participating in this morning's Eastern Panhandle Legislative Caucus were Delegates Larry D. Kump, John Overington, Daryl Cowles, Walter Duke, Ruth Rowan, and Gary Howell. Click on the link below for this recent news story, and, to discover more political insight about the dynamics of today's ongoing issues, also click on "Mouseland, a Fable for Our Time" (under "Videos" on the right hand side of this webpage). Additional legislation that I have cosponsored is HB 4555, HB4556, HB 4558, and HB4563. HB 4555 would exempt the first $20,000 in pensions and social security benefits from West Virginia income taxes. HB 4556 would permit the option of allowing previously used names on West Virginia Driver's Licenses. HB 4558 would ease the penalties used to revoke West Virginia Driver's Licenses for minor infractions. HB 4563 would save West Virginia taxpayers many millions of dollars by revising the method that wages are set for public construction projects. 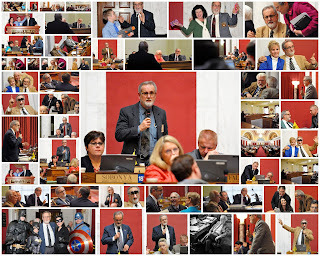 Click on "WV State Legislature" under "Links" on the right hand side of this webpage for more legislative information. The House of Delegates Committee on Constitutional Revision today recommended passage of an amendment to the West Virginia Constitution to give counties the option of increasing homestead property tax exemptions for senior citizens and the disabled (HJR 113). The committee also recommended passage of a constitutional amendment to enable the Legislature to provide property tax relief for individuals actively serving in the armed forces (HJR 114). Further consideration of both of these proposals now will be reviewed by the House of Delegates Finance Committee. Since both the above proposals are constitutional amendments, a two-thirds approval vote also will be required by the Legislature and thereafter a majority approval vote by voters in the next election before the proposed amendments become law. It pleases me to be one of the sponsors of HB 4513, which would further protect and enhance the Second Amendment rights of all West Virginia Citizens. Click on "WV State Legislature" under "Links" on the right hand side of this webpage for more information on legislative issues. In the Eastern Panhandle Legislative Caucus meeting this morning, West Virginia Division of Transportation spokesperson Marvin Murphy gave an extensive update on road projects within the Eastern Panhandle. Mr. Murphy explained that West Virginia still is waiting for specific federal budget project funding for about $400 million. He also reported that the I-81 widening project between Marlowe and the Potomac River should be completed this year. Discussions also are ongoing with Maryland regarding the widening of the I-81 bridge over the Potomac River. Improvements to Rt 9 from Martinsburg to Berkeley Springs as well as Rt 522 also are under review. The caucus also requested that a turn lane be added to Rt 9 at the site of the new Division of Motor Vehicles office. Berkeley Council Councilperson Elaine Mauck discussed Berkeley County government concerns and Eastern Panhandle Conservation District issues also were reviewed. Much concern and frustration was expressed by the caucus about the West Virginia County Commissioners Association opposition to helping senior citizens get additional property tax credits. State legislators participating in this caucus meeting were Delegates Daryl Cowles, John Overington, Larry D. Kump, Walter Duke, Ruth Rowan, Eric Householder, Gary Howell, and Tiffany Lawrence. It pleases me to be one of the sponsors of HB 4473, HB 4476, and HB 4478. HB 4473 would dedicate part of the Marcellus gas severance tax income to reduce personal property taxes. HB 4476 would reform the West Virginia Freedom of Information law to make it easier for citizens to get non-confidential information from state government agencies. HB 4478 would give state police a modest pay raise and establish a minimum staffing level. More information on these bills and other legislative issues is available by clicking on "WV State Legislature" under the "Links" section on the right hand side of this webpage. The Eastern Panhandle Legislative Caucus held a brief, truncated meeting this morning. Participating were Delegates Larry D. Kump, John Overington, Walter Duke, Ruth Rowan, and Daryl Cowles. The need for passage of Homestead Exemption improvements and other property tax credits for senior citizens were discussed. Included in these efforts are HB 2672, HB 4339, and HB 4369. We still are waiting on the West Virginia State Rail Plan and how it will affect the Maryland Area Regional Commuter (MARC). There has been no progress on HB 3256 (end times for bars serving alcoholic beverages). SB 362 (Cacapon State park) still is being considered in the Senate. HB 4412 would create another judicial circuit in the Eastern Panhandle. Concerns were expressed about funding of roads and a representative from the West Virginia Department of Transportation will be invited to a future caucus meeting. Energy is a tremendous West Virginia natural resource, and the non-partisan efforts by the West Virginia Legislature and Governor to attract developers of our Marcellus gas deposits are praiseworthy indeed. Hopefully, these efforts will result in protection for our environment, more good paying jobs for our citizens, and additional revenue for our State Budget (that can and should be used to reduce our other taxes). All of which reminds me of that old maxim: "What's good for the goose is good for the gander.". Wouldn't all of us Mountaineers be so much better served if the tax breaks and other incentives given to the Marcellus gas developers also were given to all West Virginia employers? It pleases me to be a cosponsor of HB 4369, HB4370, and HB 4382 on property taxes, schools, and homeowners' associations. HB 4369 increases property tax credits for low income senior citizen and disabled taxpayers. HB 4370 reforms the school aid formula by reducing each county's local share of school expenses. HB 4382 requires homeowners' association dues and fees to be placed in a trust account of a financial institution and for account statements to be available to each homeowner in their respective associations. Details on these and other legislative bills are available from the West Virginia Legislature's website. You may link with that website by clicking on "WV State Legislature" on the right hand side of this webpage (under "Links").